I can't wait to make these for a church function this weekend! Look how yummy! I'm keeping it simple by just using store bought chocolate cake mix and fudge from a squeeze bottle for the topping. I'm also going to make 'slutty brownies' too. But I will call it 'Ultimate Chocolate Chip Cookie n’ Oreo Fudge Brownie Cake' instead! I'm turning it into a cake instead of brownies. And I will also keep it simple by using store bought chocolate chip cookie mix & brownie mix from a package. This looks super yummy too! If you’re looking to get a head start on your Mother’s Day shopping or want to snag several personalized gifts for teachers, friends, or family members, you’ll definitely want to check out this *HOT* offer! Currently, Vistaprint is offering up a large selection of completely FREE items… just pay shipping! Choose from Business cards, personalized Coffee mugs, Sticky Notes, Checks, Note pads, Postcards, Mousepads, and lots more! Even sweeter, you can snag more than one FREE item from Vistaprint in your order and get a reduced shipping cost! This person was able to add 250 personalized Business cards, Sticky Notes, Mousepad, a Coffee mug, and Photo Flip Book for a total of ONLY $8.08 for shipping! That makes each item less than $2 shipped to your door, which is a *HOT* deal considering you can customize everything. * Do NOT add any additional items to your order. * On the partners offers page, make sure to SKIP all the offers by leaving the boxes unchecked. * My cart total came to only $8.08 shipped for all items listed below! WOW! WooHoo! In honor of Leap Day, Cardstore.com is offering up a FREE greeting card (with envelope) + FREE shipping! All you need to do is select and personalize your card, then enter the new coupon code CCC2029 during the final stage of checkout (after entering your shipping info). * This is only available to the first 29,000 so act fast! 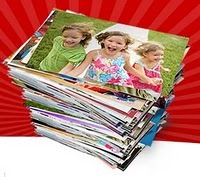 Snapfish is currently offering $0.01 photo prints when you use coupon code PRINTSFEB at checkout. If you order 100, your total with shipping should be around $7. This coupon code is good through February 20, 2012. Cardstore.com: FREE Greeting Card ... A NEW CODE! Woo Hoo! Once again, Cardstore.com is offering up a FREE greeting card (with envelopes) + FREE shipping! All you need to do is select and personalize your card, then enter the coupon code MCSFC0212 (appears to be working again for those of you who missed using it previously?) during the final stage of checkout (after entering your shipping info).